Ferroplan Ltd renovated as a turnkey contract a new water treatment plant for the Nivos Ltd in the city of Mäntsälä, Finland during the year of 2016. The old building was expanded and sodium hydroxide treatment process was replaced by Ferroplan’s own Natwat- technique, in which iron and manganese are removed from water by multi-phase oxidization, stripping, biological filtration and mechanical filtration process. At the same time the aggressiveness of the water is removed by stripping the carbon dioxide and by using the alkalizing filter media. This will protect the water network from corrosion. Microbiological safety of the treated water is guaranteed with ultraviolet reactor after the main process The Process works without any additional chemicals, for which reason the operational costs are minimized. In addition, the gravitational process is safe to use and operate for the personnel. 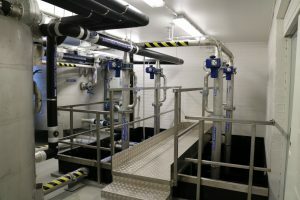 Facility produces first class drinking water for the city of Mäntsälä up to 1500 m3 per day.